What is Combined Defence Service Examination? Can I give CDS exam after 12th? How can I apply for CDS Exam 2019? How many times CDS exam is conducted in a year? NOTIFICATION: The Union Public Service Commission (UPSC) (A Government of India Undertaking) inviting online applications for filling up 417 vacant posts of Officers in various disciplines (Indian Military Academy, Naval Academy and Air Force Academy and Officers Training Academy, Chennai for the courses (Men and Women)) through Combined Defence Services Examination I 2019 (CDS Exam I - 2019) from eligible and interested willing male & Female candidates. It is latest & good information for unemployed personnel those who are looking for these new Jobs in Government sector & other organizations. Job seekers, who wish to apply for these vacancies regarding UPSC CDS Recruitment 2019, must have passed Graduate in concerned discipline. Applicant’s upper age should be as per Govt. rules and age relaxation is applicable to all reserved category candidates i.e.SC/ST/OBC/ Women candidates etc. NO OF POSTS: 417 vacant posts of various Officers (CDS 1 -2019) in various disciplines through The Union Public Service Commission (UPSC). 1. Indian Military Academy, Dehradun 148th (DE) Course commencing in Jan, 2020 including 13 vacancies reserved for NCC `C’ Certificate (Army Wing) holders: 100 posts. 2. Indian Naval Academy, Ezhimala-Course commencing in Jan, 2020 Executive (General Service)/Hydro [including 06 vacancies reserved for NCC ‘C’ Certificate holders (Naval Wing)]: 45 posts. 3. Air Force Academy, Hyderabad-(Pre-Flying) Training Course commencing in Jan, 2020 i.e. No. 207 F(P) Course. [03 vacancies are reserved for NCC `C’ Certificate (Air Wing) holders through NCC Spl. Entry]: 32 posts. 4. Officers’ Training Academy, Chennai (Madras) -111th SSC (Men) Course (NT) commencing in April, 2020 [(i) 171 vacs for SSC (Men) (NT) UPSC, (ii) 04 vacs for JAG (Men) (NT) April, 2020 Non UPSC and (iii) 50 vacs for NCC Special entry Non UPSC]: 225 posts. 5. Officers Training Academy, Chennai-25th SSC Women (Non-Technical) Course commencing in April, 2020: 15 posts. 1- Indian Military Academy and Officers' Training Academy: A passed of Degree of any recognized University or equivalent. 2- Naval Academy: A passed of Degree in Engineering from any recognised University. 3- Air Force Academy: A passed of Degree of a recognised University (with Physics and Mathematics at 10+2 level) or Bachelor of Engineering from any recognised University. NOTE: Candidates who are studying in final year Degree Course and yet to pass final year degree examination or equivalent examination can also apply for the Examination, but they will be required to submit proof of passing the Degree Examination or equivalent examination by the specified dates. PHYSICAL STANDARDS: Candidates must be physically fit according to physical standards for admission to Combined Defence Services Examination (I), 2019 as per guidelines detailed advertisement. 1- IMA: Unmarried male candidates born not earlier than 2nd January, 1996 and not later than 1st January, 2001 only are eligible. 2- Indian Naval Academy: Unmarried male candidates born not earlier than 2nd January, 1996 and not later than 1st January, 2001 only are eligible. 3- Air Force Academy: 20 to 24 years as on 1st January, 2020 i.e. born not earlier than 2nd January, 1996 and not later than 1st January, 2000 (Upper age limit for candidates holding valid and current Commercial Pilot Licence issued by DGCA (India) is relaxable upto 26 years. i.e. born not earlier than 2nd January, 1994 and not later than 1st January, 2000) only are eligible. 4- Officers' Training Academy - (SSC Course for men): Unmarried male candidates born not earlier than 2nd January, 1995 and not later than 1st January, 2001 only are eligible. 5- Officers' Training Academy- (SSC Women Non-Technical Course): Unmarried women, issue less widows who have not remarried and issueless divorcees (in possession of divorce documents) who have not remarried are eligible. They should have been born not earlier than 2nd January, 1995 and not later than 1st January, 2001. AGE RELAXATION: As per Govt. rules age relaxation is applicable for said post to all reserved category candidates for CDS- 1/ 2019 Application Form/ UPSC 2019 CDS -1 Notification, Apply Online. 1. Lieutenant Level -10: Rs. 10 56,100 – 1,77,500/-. 2. Captain Level – 10B: Rs. 10 B 6,13,00-1,93,900/-. 3. Major Level - 11: Rs. 11 6,94,00 – 2,07,200/-. 4. Lieutenant Colonel Level 12A: Rs. 1,21,200 – 2,12400/-. 5. Colonel Level 13: Rs. 1,30,600-2, 15,900/-. 6. Brigadier Level 13A: Rs. 1,39,600-2,17,600/-. 7. Major General Level 14: Rs. 1,44,200-2,18,200/-. REQUIRED APPLICATION FEE: For said vacancy a non- refundable application fee is to be paid by the candidates as per rules. An amount of Rs.200/- by General & OBC candidates to be paid either by depositing the money in any Branch of SBI by cash, or by using net banking facility of SBI, State Bank of Bikaner & Jaipur/State Bank of Hyderabad/State Bank of Mysore/State Bank of Patiala /State Bank of Travancore or by using Visa/Master Credit/Debit Card. Female/SC/ST candidates are exempted from paying of fee. बैंकिंग कार्मिक चयन संस्थान ने 1599 पदों पर Special Officer की भर्ती के लिए एक अधिसूचना जारी की है। इच्छुक उम्मीदवार यहाँ आवेदन कर सकते हैं। आवेदन करने से पहले पूर्ण अधिसूचना यहाँ पढ़ें । 1599 vacant posts of Specialist Officers in I.T. Officer (Scale-I), Agricultural Field Officer (Scale-I), Rajbhasha Adhikari (Scale-I), Law Officer (Scale-I), HR/ Personnel Officer (Scale-I), Marketing Officer (Scale-I) disciplines through Institute of Banking Personnel Selection (IBPS). LAST DATE TO APPLY: From 06-11-2018 to 26-11-2018. SELECTION PROCESS: Applicants who are screened for applicability /eligibility are being selected as per organization policy/rules depending on the basis of their performance in written exam, SSB Interview and Medical Examination. Last Date of Online Applications Form: 26th November 2018. Date of Examination: 03rd February 2019. INQUIRY/GUIDANCE OF CANDIDATES: In case of any guidance/ information /clarification regarding their application, candidature etc. candidates can contact UPSC’s Facilitation Counter near Gate ‘C’ of its campus in person or over Telephone No.011-23385271/011-23381125/011- 23098543 on working days between 10.00 hrs to 17.00 hrs. AGARTALA, AHMEDABAD, AIZAWL, ALLAHABAD, BENGALURU, BAREILLY, BHOPAL, CHANDIGARH, CHENNAI, CUTTACK, DEHRADUN, DELHI, HARWAD, DISPUR, GANGTOK, HYDERABAD, IMPHAL, ITANAGAR, JAIPUR, JAMMU, JORHAT, KOCHI, KOHIMA, KOLKATA, LUCKNOW, MADURAI, MUMBAI, NAGPUR, PANAJI (GOA), PATNA, PORT BLAIR, RAIPUR, RANCHI, SAMBALPUR, SHILLONG, SHIMLA, SRINAGAR, THIRUVANANTHAPURAM, TIRUPATI, UDAIPUR AND VISAKHAPATNAM. NOTE: Applicants should note that there will be a ceiling on the number of candidates allotted to each of the centres except Chennai, Delhi, Dispur, Kolkata and Nagpur. Allotment of Centres will be on the first-apply-first-allot basis and once the capacity of a particular centre is attained, the same will be frozen. HOW TO APPLY: For said posts (Combined Defence Services Examination I 2019 (CDS Exam I -2019) eligible, willing and interested candidates may apply through online at official website up to last date. Applicants must retain a hard copy for future reference. 6. Fill in all the mandatory fields like name, gender, etc and click on “Continue”. 9. Again re login and click on “Click Here (Part-II)”. 11. Fill in all the required details and upload scanned photo and signature and click on “Submit” Button. 12. After submission of Online Application take print out of finally submitted application and retain it for future reference. 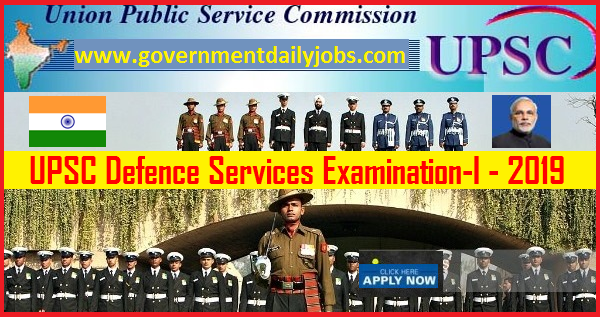 CONCLUSION: The Union Public Service Commission (UPSC) invites online application for the recruitment of 417 vacant posts of Officers in various disciplines through Combined Defence Services Examination I- 2019 (CDS Exam I -2019 on regular basis from Indian residents who are eligible & interested; candidates can apply through online application. 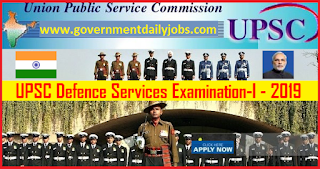 LAST DATE TO APPLY: 26-11-2018 for UPSC 2019 Combined Defence Service Examination -1.